If you're in the market for an affordable laptop, odds are you've already considered a Chromebook. You may even have considered this one: the Acer Chromebook 14 for Work, with its $300 MSRP, is already a fine deal. Now, though, it's on sale at BJ's Wholesale Club for $179.99, a whopping $120 off. While the 14 may not be the sexiest Chromebook in town — it's no Pixelbook — it's perfectly serviceable for lighter tasks like typing and tooling around social media with four gigs of RAM, a USB-C port for charging, data, and video output, and Play Store access. Because BJ's is a club retailer, you do need a membership to snag this deal. A full-fat membership runs $55 a year, but you can also get an "Online Access" membership, which lets you order stuff from BJ's website for a year, for 10 bucks. 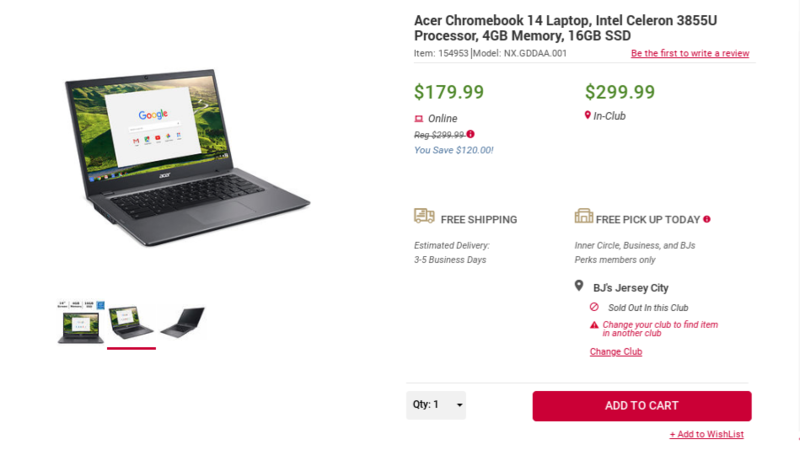 So if you're not already a member, that brings the total cost of the Chromebook 14 for Work to $189.99 — still not a whole lot for what you're getting.